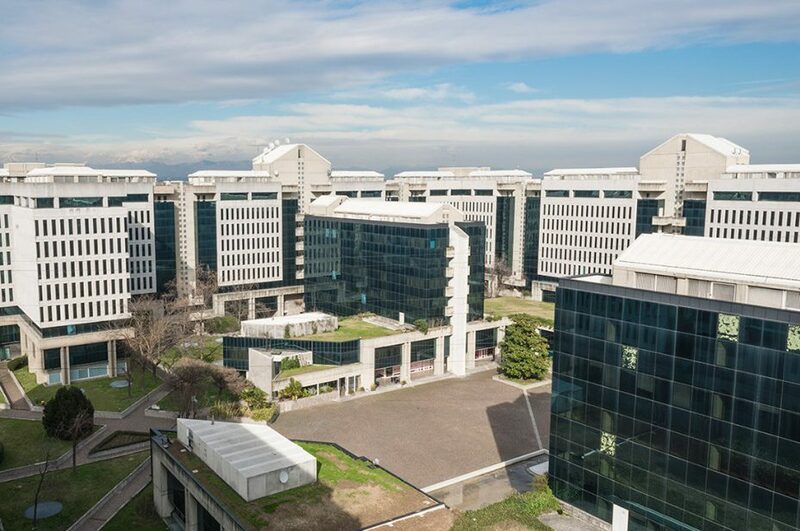 Located on the eight and last floor in the “Centro Direzionale Milano Oltre” business center the property stands out for its wide size, for its large windows that surround the perimeter overlooking the Lombard plain and the North-Western Alpine chain mountains. Staggering 300-degree views and amazing spectacular sunsets constantly accompany the busy business hours. It is in a strategic position of connection with the main roads, motorways and airports, an essential requirement for a dynamic and modern Company. Our offices represent the image of your Company! We are selling prestigious office space in the “Centro Direzionale Milano Oltre” in Segrate. Our property is situated at the most ‘prestigious level’, namely the eighth (top) floor of a corner building with outlook on three sides. The office has a breathtaking view and large windows with a lot of light. The space, which extends for 750 square meters, is partially furnished with beech wood finishes as well as crystal and steel, removable on demand if desired, in order to achieve a very large open space adaptable to the occupant’s needs. The offices have a central fully air-conditioned system, with regulators to adjust the intensity (hot / cold) area by area. The property enjoys two comfortable panoramic terraces for recreation and/or smoking. 2 archives of 17 e 32 sqm, respectively located on the terraces of the building as well as 2 outside storage areas. Floating floors for housing the electrical and computer equipment. Large basement of 45 sqm. Offices equipped with 24hour concierge to welcome the guests and turnstiles for maximum security control. 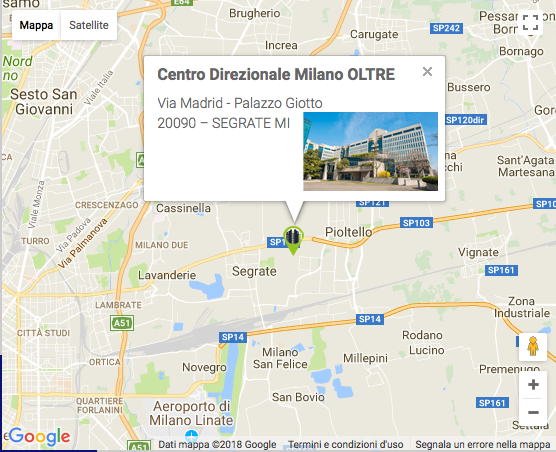 Our offices are located in ‘Milano Oltre’, a modern and well organised business centre. It enjoys a strategic position being situated in the municipality of Segrate, close to Milan, just 15 minutes from Linate airport, and 40 minutes from Orio al Serio. Easily accessible via major highways, the business centre is 4 km from the junction of Lambrate (on the Tangenziale Est ring road). It is adjacent to Via Cassanese, near the connections with the Tangenziale East Ring Road, with the new Tangenziale Esterna EST ring road east of Milan (T.E.E.M) and the BreBeMi Highway which has just recently been built. A daily service with modern shuttle buses that facilitates connection to the Business Centre and the Underground network (Lambrate railway station or Piazza Udine) ‘active. Buses connecting the Business Centre to the Segrate train station.